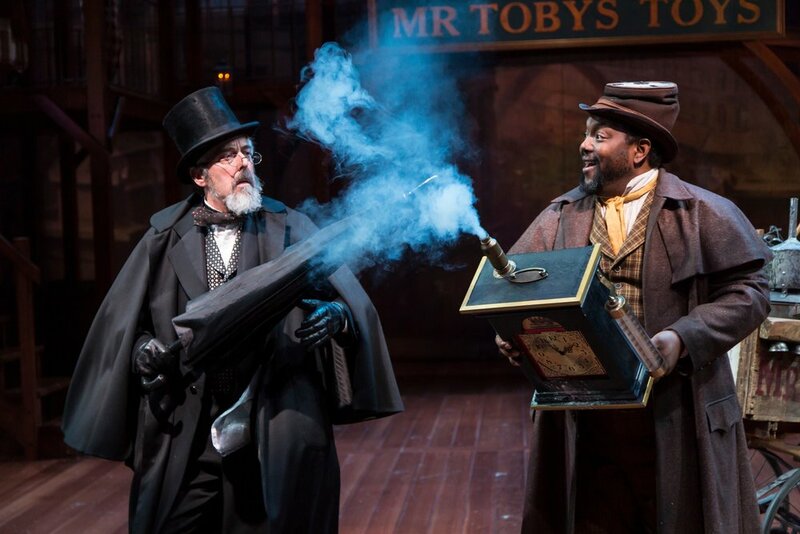 The Hartford Stage’s annual production of Charles Dickens’ A Christmas Carol, as adapted by Michael Wilson, gets a new wrapping this holiday season. With a new Scrooge and second-time director Rachel Alderman at the helm, the well-known story has a different feel. Nothing too drastic, mind you—this is still the story of how a miserly curmudgeon’s reclamation from a mean, grasping life helps to make the season bright. And yet I was struck by a different tone to the whole, and that makes for a bit of a new experience. The venerable Bill Raymond played Ebenezer Scrooge for many a year, and his version aimed to tickle more than provoke. The play—despite some dark patches—ends happily for all, so there’s much to be said for keeping the spirits high throughout. This year, Michael Preston—formerly seen in the role of Mr. Marvel—gives Scrooge a decidedly more donnish air. Looking like an overweening professor not likely to give high marks to anyone, Preston is far less madcap than Raymond and more haunted. The story of a man who has to come to terms with his past before it’s too late has much to commend it dramatically. And that’s what Alderman’s version puts before us. What’s more, I found myself thinking, it doesn’t really have to be a Christmas story. 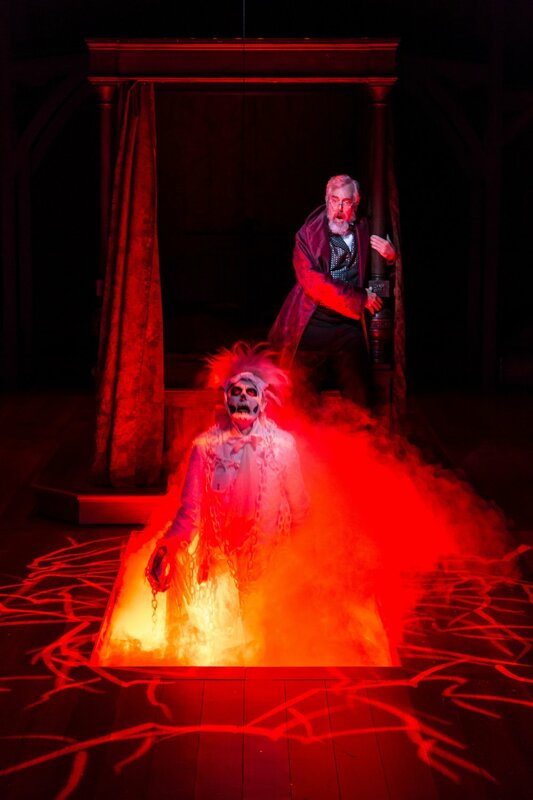 The Hartford Stage adaptation has always foregrounded the ghosts—with all those skeleton-headed apparitions—and they needn’t be tied to the virgin birth. They represent skeletons in the closet, so to speak, and the past that haunts us with its malevolent glee that we can’t do anything to change it. This year, the big clocks that spin as projections on the stage seemed all the more baleful. Preston’s Scrooge is a man full of remorse and the ghosts make him live through the pain of his past (even those who warmed it, like his sister, his fiancée and his old boss, are now gone), the heartlessness of his irritable present, and the dark forebodings of the future. His interplay with the shades of things that were, are, and may be is as full of psychological truth as it is of supernatural soliciting. The change in the tone of the central role made me think a bit more about this story than I tend to do, since I know it so well. Dickens came up with a double-whammy winner—Christmas and ghosts—and that has made the story so enduring. And it’s also a story that has the great novelist’s sense of caricature, and so all the characters are indelible. And that means there’s many a fine role for the cast. Two of the best fall to Noble Shropshire, fearsome as Marley’s ghost and winning as Scrooge’s servant Mrs. Dilber. John-Andrew Morrison, the new Mr. Marvel—a seller of novelties—is lively, as are the Fezziwigs (Kenneth De Abrew and Shauna Miles). 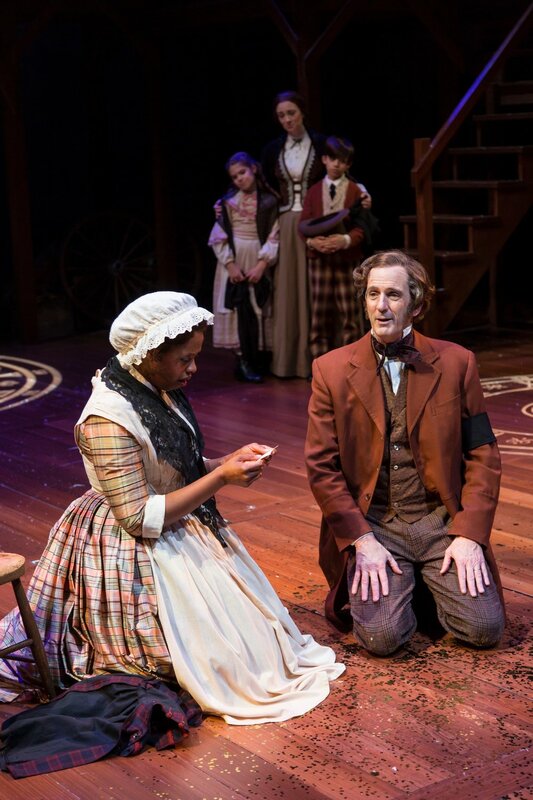 Miles also doubles as a particularly strong Mrs. Cratchit, with Robert Hannon Davis her suitably chastened husband, Bob. Alan Rust returns as the Ghost of Christmas Present, and Bert, a beverage purveyor, and is quite grand as both. And this year Rebekah Jones gives the Ghost of Christmas Past a bit more stately melancholy. 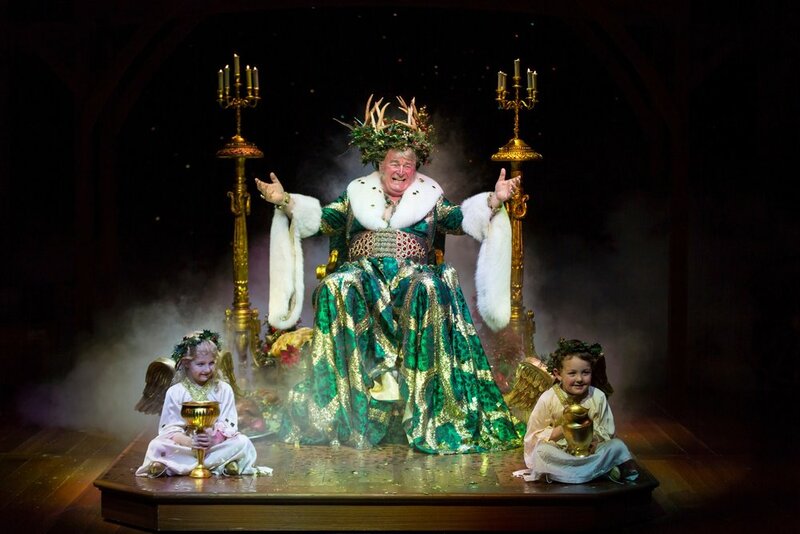 The staging is fluid, with props more than sets, and, while that works fine for Scrooge’s bedroom—with its imposing fourposter—and his counting house, it’s less successful at suggesting the Cratchits’ cramped hovel. And so the party sequence hosted by Scrooge’s nephew (Terrell Donnell Sledge) and his wife (Vanessa R. Butler), with numerous guests and games, is a welcome set-piece in Act Two. The large, varied cast, the lighting, costumes—especially the ghostly apparitions from different historical eras—and special flying effects all add up to colorful and exciting spectacle. The many children in the production add to the cheer, and seem all the more a reminder of how swiftly the world of youth passes away. In the end, of course, Scrooge recognizes the true meaning of Christmas—in its “do unto others” sense—but one could also say he realizes that the only way to overcome the past is to pay it forward for the future. A lesson our leaders would do well to consider, though the spirit of the unregenerate Scrooge seems more than ever apparent just now.